Natural gas prices have been soaring on both sides of the US-Canada border all through January—but just the leading natural gas stocks are breaking out–tepidly, and only after an extended stretch of very cold weather across the entire continent. That’s the Market saying it believes that once this cold winter is over, continued supply increases will keep a lid on gas prices. The so-called Polar Vortex has definitely decreased gas in storage—North America is below the five year average for the first time in five years—so investors can expect a floor in prices roughly the same as last year, despite increased supply. Unless you’re in Canada, that is, says the US arm of brokerage firm Raymond James in a January 27 report. It’s very sober reading for Canadian natural gas producers and investors. 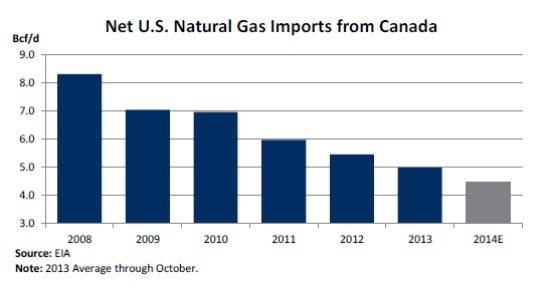 Canadian gas exports to the US are down almost 50% in the last six years. Losing Eastern Canada as a market–which is 1.4 bcf/d and growing–would be a major problem for Canadian producers if another outlet to sell natural gas isn’t opened up. It makes west coast LNG—Liquid Natural Gas exports to Asia—a must. Canadian gas prices are already seeing a greater discount to US prices than normal just to stay competitive in North America. Canada is usually 30 cents an mcf (million cubic feet) cheaper than US gas in winter and 50 cents in summer. Now it’s a 68 cent discount and it’s a steadily increasing discount to 90 cents by the end of 2015 in the futures market now. This winter’s recovery in natural gas prices may not be the light at the end of the tunnel–that may be from a train barreling down the track, with the name MARCELLUS in bold letters. From June 2009 through December 2013 United States natural gas production (including Alaska and the Gulf of Mexico) increased from 70 bcf/day to 83 bcf/day. Of that 13 bcf/day increase, a whopping 10 bcf/day came from the Marcellus Shale alone. The Marcellus has grown at a rapid rate even in the face of stubbornly low natural gas prices. 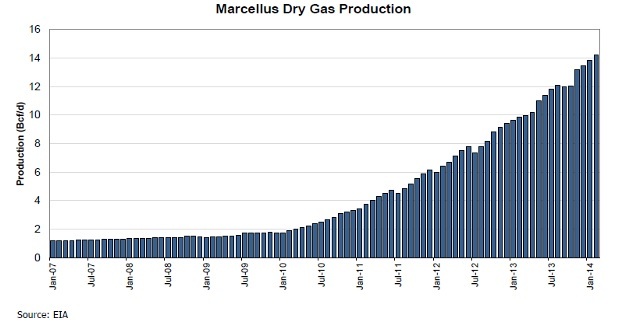 When will Marcellus production peak? That is Big Question #1. There are thousands of undrilled well locations remaining in the play and Marcellus economics work at very low gas prices. At just $4/mcf, rates of return from drilling wells in the Marcellus reach as high as 60%. These stellar economics will keep Marcellus production growing in all but the most pessimistic of natural gas price scenarios. Expectations for the Marcellus are for production to increase by another 3 bcf/day in just 2014 alone. The Marcellus is the monster shale gas play and is already turning the North American natural gas game upside down—just recently it forced the partial reversal of the $4 billion REX pipeline, which was built only a few years ago to get Rockies gas east to the lucrative New England market. Now Marcellus gas will flow west. Big Question #2—where is all of this natural gas going to go? It appears a chunk of it will be heading north to Canada. For decades Canada has exported a lot of natural gas to the United States. Western Canada produces way more natgas than all of Canada consumes. With American natural gas production seemingly in permanent decline, this was a comfortable situation for Canadian producers. But the shale revolution that was launched initially in the Barnett Shale in Texas in the late 1990s changed everything. Canadian exports of natural gas to the United States peaked in 2008 at just over 8 bcf/day. By next year that figure will have dropped to 4.5 bcf/day. Almost all Canadian natural gas production comes from Alberta and British Columbia on Canada’s west coast. It costs a lot of money to get that production to the East Coast along the TransCanada Mainline pipeline. That creates an advantage for natural gas produced near the East Coast consumer. This of course favors both the Marcellus and the Utica shales in Pennsylania/Ohio/West Virginia and New York State (if they ever approve fracking). These two plays can provide cheap gas that will not only replace Western Canadian gas that is imported into the U.S., but also Western Canadian gas that is used by Eastern Canada. In 2007, Pennsylvania gas was priced 70 cents/mcf (million cubic feet) more expensive than Canadian gas. But now with all the low cost Marcellus gas, it trades at a small discount–so there is no incentive for Canadian imports. There has already been almost a 1 bcf/d swing in gas exports at Niagara Falls. Canada used to export 0.5 bcf/d there to the US, but now Canada imports 0.4 bcf/d. The TransCanada Mainline has a capacity 7 billion cubic feet per day (bcf/d). In the year 2000 it was full, but now only sends about 2.5 bcf/d of Western Canadian natural gas eastbound. On average Quebec and Ontario consume about 1.4 bcf/d (though Raymond James points out that number has risen 45% since 2009 and may continue to go up). Marcellus production growth in 2014 alone–expected to be about 3 bcf/d–will be enough to displace all of this Western Canadian gas in 2014. Raymond James says the situation is a bit more complicated than that—but not much. It will just take time to build the infrastructure that will allow Marcellus gas to be shipped more directly into Canada. Those projects combined should allow for enough U.S. natural gas to get into Eastern Canada so that no Western Canadian natural gas will be needed. This will mean that the Northeast United States will have gone in just a few years from being almost fully dependent on Canada for natural gas to having the ability to export natural gas to Canada–and fill all of eastern Canada’s needs. Meanwhile a BIG portion of Western Canadian natural gas production will need a new home, and that isn’t bullish for AECO gas prices (AECO=Canadian benchmark price set out of Edmonton AB). Investors can expect a lot of volatility in AECO natural gas prices before Western Canadian natural gas is completely forced out of Eastern Canada. It will still need gas in winter, but not as much in summer. But that low seasonal will turn permanent once infrastructure is in place to get Marcellus and Utica production into Canada. And without a new market to go to, Canadian natural gas prices are going to be facing some stiff headwinds. The current rise in AECO spot prices may not be the end of depressed prices. It may be a temporary reprieve before Canada gets a full taste of the Marcellus. I have just found an undiscovered junior oil producer in the sweetest spot of the market—and I’m going to share it with you in my next story. I expect big things from this company in the very near term. STAY TUNED.